End-stage renal disease was 3.4 times more likely to develop among patients with immunoglobulin A nephropathy compared with those who had minimal change disease, study finds. Rates of renal function decline and end-stage renal disease (ESRD) differ significantly among the 5 most common glomerulonephropathies, according to new study findings. John J. Sim, MD, of the Kaiser Permanente Los Angeles Medical Center, and colleagues used the Kaiser Permanente Southern California database 2000 to 2011, to identify a group of 2350 racially, ethnically, and socioeconomically diverse patients with glomerulonephropathy (9% younger than 18 years). Of these, 1006 had focal segmental glomerulosclerosis (FSGS), 350 had membranous glomerulonephritis (MN), 314 had minimal change disease (MCD), 269 had immunoglobulin A nephropathy (IgAN), and 411 had lupus nephritis (LN), according to biopsy results. During 4.5 years of follow-up, 497 (21%) progressed to ESRD and 195 (8%) died from other causes. 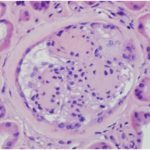 According to results published online ahead of print in Mayo Clinic Proceedings, estimated glomerular filtration rate (eGFR) declined by a median of 1.0 mL/min/1.73 m2 annually, but the rate varied by type of glomerulonephropathy. The largest annual drop in eGFR was found in patients with FSGS (-1.8 mL/min/1.73 m2), followed by MN and IgAN (-0.8 mL/min/1.73 m2 for both). Progression to ESRD was more common among patients with FSGS (8.72 cases per 100 person-years), followed by IgAN, LN, MN, and MCD (4.54, 2.38, 2.15, and 1.67 cases per 100 person-year, respectively). ESRD was 3.43, 2.35, 1.28, and 1.02 times more likely to develop in patients with FSGS, IgAN, LN, and MN patients, respectively, compared with patients who had MCD. Mortality, however, was not significantly different among groups. Their findings are consist with some previous, typically small, studies, but all, the authors noted. In the current study, patients with FSGS had worse outcomes, perhaps due to lower baseline eGFR and higher rates of hypertension and diabetes. IgAN patients also fared worse, possibly because half received immunosuppression. In addition, MCD patients had a higher than expected ESRD rate, which may have been a consequence of greater malignancy.